Availability: Walmart, Amazon, Bed Bath & Beyond, Suntek store, etc. Reviewer Background Information: I purchased this product my first week in my new apartment. I also am currently at 4th year at the University of Virginia. This product is great to use in conjunction with the Purex 3-in-1 Laundry Sheets, if you live in an apartment or a school dorm. See my Purex Complete 3-in1 Laundry Sheets Review . Now let’s get started. public washing machines, and then another $1.50 to use the public dryers. Are the dryer machines here high quality? – Hardly. Do you think you there is a chance you might have to run the dryer twice to actually dry your clothes? – You betcha. You can already see how a solution to dry your clothes could save you money in the long run. I bought a pair of dryer balls after reading a review at AOL on “As Seen on TV Products.” The dryer balls’ positive rating and five sentence description enticed me to buy them. Now I will share my discoveries with you in a more detailed manner than they did. Now let’s move on to the pros and cons. Can Easily Save You Money After a Few Weeks. This product has been effective for me. The balls I have used are the “As Seen on TV Dryer Balls. 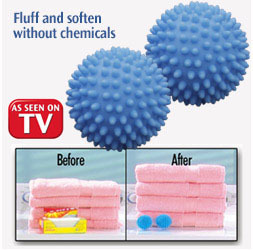 I have also used the “As Seen on TV Dryer Balls With Anti-Static Pads.” Both of which are shown in the photos here. Mind you that there are two versions of the Anti-Static Balls. I have used these ones. 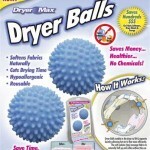 If you do not wish to spend as much money on dryer balls, there are other alternatives out there. The main alternative would be to use other soft, non-damaging ball that can allow air to travel through all of your clothing while drying. I wouldn’t recommend fruit. I would recommend using Tennis Balls. This solution has even been recommended by Martha Stewart. 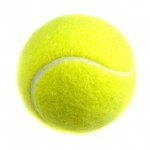 Tennis Balls are very cheap and come in large quantities so you can increase drying effectiveness. I would like to note that the dryer balls are covered in little plastic spikes. This allows the balls to effectively move and “pick up” clothing during the drying cycle. All tennis balls can do is bounce and rub against them. Well that is it for this review. 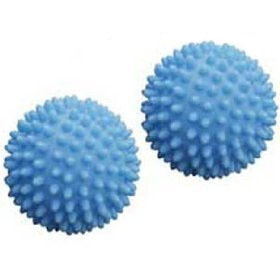 If you have any more questions about these balls feel free to leave a comment and I will do my best to answer. This entry was posted	on Saturday, September 19th, 2009 at 5:04 AM	and is filed under . You can follow any responses to this entry through the RSS 2.0 feed. You can leave a response, or trackback from your own site.